Provide comfort for the family of Joan Whytock with a meaningful gesture of sympathy. WHYTOCK, Joan Ann (nee Parkin) - passed away on December 29, 2018 in Brockville, age 78 years, two days after a large family Christmas gathering where she was surrounded by her grandkids. Joan was predeceased by her husband, Lawrence Grenville Whytock. She leaves behind her children Anne (Lyndsey) and John (Julie), grandchildren Adam, Bronwen, Joel, Ruth and Sean, and her brother Allen Parkin. 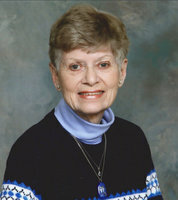 Joan had two careers, first at the International Civil Aviation Organization in Montreal and later with the Upper Canada District School Board. She loved to travel, and the shelves at home were full of photo albums from favourite trips. She was a great volunteer and organizer, and a loyal friend who would do anything for someone in need. Family, though, always came first, as evidenced by the photos on every wall and surface. She kept every letter, card and piece of art. Family and friends are invited to gather at the Irvine Memorial Chapel at Roselawn, 2451 County Road 15, Maitland on Saturday, April 27, 2019 from 12:30 -2 pm. A ceremony in remembrance of Joan will take place in the chapel commencing at 2 pm followed by interment. Special thanks to Alan Bennett and Kim Heath of Wall St. United Church, who supported Joan and Larry with love and friendship over many years, and to the many friends who reached out to Joan throughout her illness. In Joan’s memory, donations to Wall Street United, the BGH Palliative Care Team, or the charity of your choice would be gratefully received. Provide comfort for the family of Joan Ann Whytock (Parkin) by sending flowers. Joan was a very good friend and neighbour to us when we all lived on Devon Drive in DDO (Montreal) many years ago and we still fondly remember her many kindnesses. We send our condolences to Anne, John and their families in the loss of their dear mother - she will be greatly missed. So many years, so many happy memories with both Joan and Larry. And over 30 years of bridge games with Joan and our “Thursday Night Ladies’ Group”! Wonderful times! How we will all miss our good friend! Peace to you, Joan. Dear John, Anne and families, I am sending you my deepest condolences on the passing of your mother, my friend, Joan. I have so many wonderful memories of times spent with Joan over the last few decades. Whether at the bridge table, travelling somewhere together or just enjoying each other’s company over a meal. I still have some of Joan’s favourite recipes and will serve them again in her honour. I miss you, Joan.